Sabbath was well spent yesterday even though we missed SML because we were with good companies. Our morning started at 11am, a lunch date with my ex-colleague and also good friend, A. Since we have difficulties spending time together except for the regular hi and byes, we decided to spend time and go for our "love" we share together -- vegetarian food. pic.courtesy of durianseed.My camera konked out! After dealing with the morning traffic at Sukhumvit road, Hobbit and I met with A at this exquisite but modest Thai vegetarian restaurant called Khun Churn. 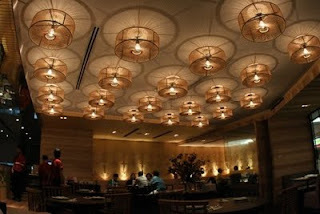 I was enthralled upon entering the place and for a second I thought I was about to dine in a five star-rated, zen influenced, modern concept restaurant and just like that, I got my first impression. By the time we arrived, A was already there with some savory appetizers she kindly ordered on the table. Not to waste time, we immediately got the menus and ordered the entrees. 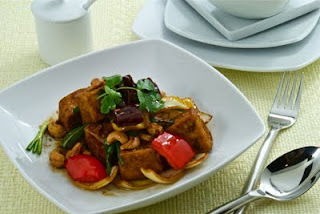 Browsing through, I was thrilled to see the variety of thai food made into mocks! They have huge range of dishes from mieang ta krai bai cha pla to khao soy and larb Esarn. As I was told, this is the only Thai macrobiotic restaurant in Bangkok that serves organic vegetables and brown rice. Ground floor, next to Ekamai BTS station. 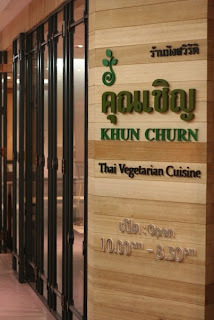 Okay, how did I ever got to write so much about Khun Churn? I need a free treat for promoting them here lol! Anyway, we were again blessed by the practices we had yesterday evening and of course I also enjoyed my small Orlando vacations and ice-cream treat on the way home.